Queensland is known for its long summers, seasonal storms, and wet weather. Protection against the elements is a common concern for customers. Making the right choice in the beginning will ensure your window coverings remain functional, attractive, and manageable over time. Smart window covering choices will also keep heating and cooling in your home effective, affordable, and environmentally sound. Here is an overview of some of the weather conditions in Queensland and how our window coverings can help. Insulation is a key consideration in Queensland climates. Many homes have single glazed windows and in most cases, these cannot be double glazed without great expense.Blinds will keep your home cooler for longer during summer. When temperatures drop in winter, the insulation offered by blinds will keep your rooms cosy. Available in a wide range of colours and designs so you don’t have to compromise on style, blinds are a great choice for both residential and commercial premises. Blinds and sheer curtains can soften a window area while still allowing light into the room. The right materials add a physical barrier against weather and also help to create a cooler look from the inside. Blinds and curtains are available in block-out, light filtering, or sunscreen fabrics so you can choose the degree of protection you need. Selecting shades in lighter colours such as whites, blues, greys, and greens will keep the room feeling cooler. Contemporary homes are often designed with air flow in mind. Venetian blinds are ideal in areas that are designed to catch the breeze while still providing privacy and protection. 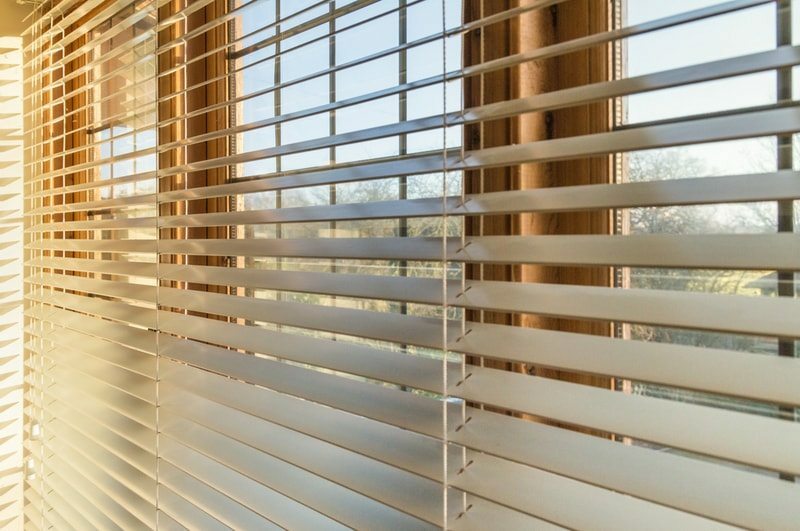 The Venetians from Modern Blinds now come in a Woodnature range, giving your home the look of wooden blinds while offering protection from moisture in the air. Made from PVC, Venetians are easy to clean and they are also warp and fade-resistant; this makes them perfect for the Queensland climate! Open plan living spaces are a design often favoured in tropical environments. But if you require more privacy, you may wish to consider Panel Glides. These are an ideal room divider, with a softer aesthetic than an internal wall. Panel Glides keep renovating costs down and as they are not a permanent fixture, allowing for change and movement should you wish to re-arrange things. Panel Glides can also be used over windows and sliding doors. Some rooms in your home or building may be exposed to relentless sun and retain a lot of heat. In these cases, a block-out covering is a good option. A Roller Blind or curtains in a block-out fabric will keep the rooms cool and dark during harsh weather, and they can simply be opened again when it starts to cool down. Humidity is another concern for Queenslanders. It can be combated by choosing coverings that are durable and easily cleaned. If you live in a humid area, Plantation Shutters or Venetians are a great option as they allow air to flow through the slats. Visionwood and Clifton Shutters perform brilliantly in humid conditions and are easy to clean and operate. The harsh sun can cause fabrics to fade. If you have an exposed area, keep this in mind when choosing your blinds. Visionwood Venetians will not fade, while blinds made in awhite or light shade will also reflect the light and heat. Modern Blinds are experienced providers of window coverings from the Gold Coast to Brisbane and beyond. We offer a range of innovative designs that can be custom fitted to your windows and sliding doors, minimising the impact of weather on your home or business. To talk through your options, contact us today.